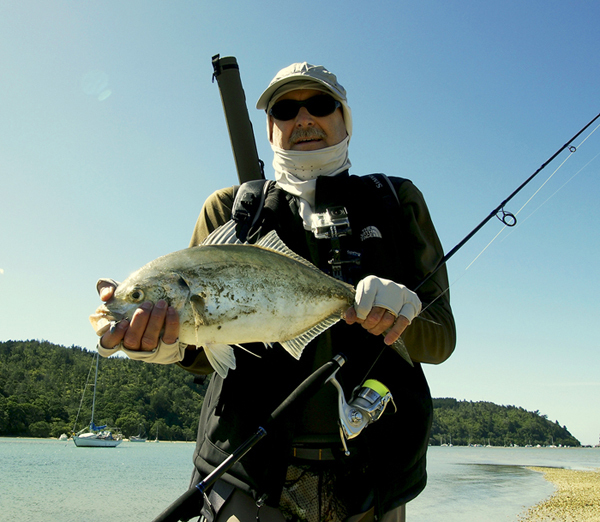 Catching flats trevally on soft plastics can occasionally be a relatively straight forward exercise, especially during autumn and winter. This article from the archives describes a two hour session on the flats and shows how easy it can be to connect with trevally when using soft plastics. On this occasion, Paul Smith & I had arranged to meet at an estuary that I knew well and fish the last couple of hours of the ebbing tide. Paul videoed the entire session and it subsequently became the Active Angling NZ video “Spinning and Flying”. “The main aim of the session was twofold, test a new 9’ Anyfish, Anywhere (AFAW) lure rod designed to handle both soft plastics and hard bodies and get some video footage of a fly fisherman in action. Paul had brought multiple GoPro cameras and his radio controlled quad copter to take some aerial footage. He mentioned that he was also dead keen to film an angler fighting fish so I walked out across the flats heavily burdened with the pressure of expectation. You could tell by my footprints as they were at least 12” deeper than Paul’s. Paul set about assembling his gear as soon as we got to the channel while I knotted on a 4.5 gram Nitro jig head and adorned it with a 2 ½” PowerBait shad. 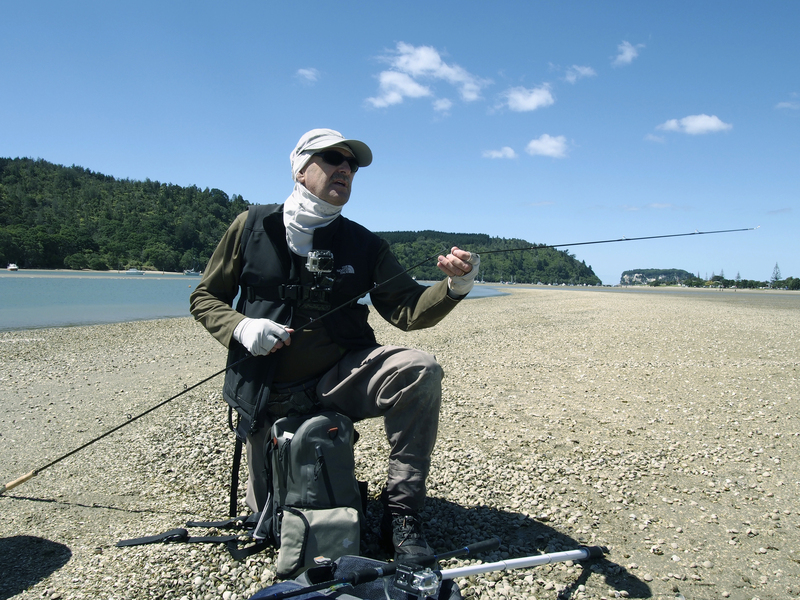 Paul was still in the midst of his preparations when I sent my first cast arching across the estuary. I was amazed at the distance that the tiny jig head travelled on the AFAW rod rated at 15 – 40 grams. Granted there was a tail wind but it easily flew 10’ further than I would have expected. It was a perfect cast landing at 10 o’clock, slightly upstream of where I was standing. The jig head sank quickly and I mended the line upstream to ensure that the line was following the lure downstream. Within seconds the lure began to beat a seductive tattoo on the bottom as it headed towards the harbour mouth, pushed along steadily by the outgoing tide. It travelled about 20’ before the lure got absolutely slaughtered by something decent. First cast. I yelled “Yep, I’m in” as the fish hit the turbochargers and set sail for the far side of the estuary. Paul was still laying out his kit neatly on the sand like a surgeon preparing for bypass surgery and mouthed his surprise at the hook up. There was an immediate cacophony of sound behind me as items were dropped and others hastily picked up. The fish meanwhile was still heading away from me and taking line at a frenetic pace. Fortunately it eventually slowed enough for me to get control and apply enough side to keep it inside the channel buoys and get it running parallel to the shore. It took off downstream on another burst and then turned tail and headed upstream against the current. Soon tiring of that it turned tail, flexed its muscles and headed downstream again, me in hot pursuit. I retreated well away from the shore and applied side to prevent it running outside of the buoys and this tactic worked well. Paul meanwhile was in his element circling around me at a respectful distance with his GoPro camera whirring. Eventually, after another five minutes or so, the fish tired and allowed me to beach it in the shallows. Paul was able to get some shots as it flapped in the skinny water and finally lay panting, beaten. It was a 4 ½ lb. trevally, a magnificent fish for a mid-day session. We were ecstatic as it was a quality fish and the rod had performed flawlessly. Returning to the task in hand, I continued to systematically work my way downstream for the next 20 – 25 minutes with any further touches. The wind was howling at times which made it tricky to keep the line tight to the lure. Eventually I made my way to the next holding area and opted to fire a cast close to the mid-stream buoy. The wind caught the cast and the lure popped in on the wrong side of the buoy. I lifted the rod tip and gave the reel two short cranks to get the lure back inside the buoy before allowing it to sink. Disaster avoided. Phew! Phew soon became “oh, sh*t!” as something big that was hanging near the buoy monstered the lure and took off at high speed. It just had to be another big trevally. The seemingly endless long initial run followed by the strong side-on resistance to being drawn shoreward, stubborn tail beating resolve and inevitable desire to head downstream to safety. Paul was again all over this, his camera capturing all sorts of footage. As the fight drew near to a close he was able to get in the shallows and film the fight underwater. We filmed the release underwater as well so fingers crossed the images are captured digitally. The trevally was virtually the twin of the first, albeit a smidgeon smaller, and would have been around 4 lb, wringing wet. I carried on for another 25 minutes without any touches. By now the wind had died down a tad so I change to fly tackle. While I tackled up Paul lovingly removed the radio controlled quad copter from its purpose built cabinet and set about getting it ready for take-off. By the time we’d done this the breeze, seizing its opportunity, had freshened. Initially it was difficult casting as the wind was strong but by tightening the back cast loop and opening the forward cast loop I was able to get about 80’ out without too much drama. Not the prettiest casting to watch but the line was going out cleanly and without incident. (You can see in the Spinning & Flying video just how much wind there was from the billowing of my shirt sleeves). As you know, I’ve mentioned that there is now a bee or wasp nest on the far side of the estuary and the ba****ds now head towards you on a fairly regular basis. It is particularly disconcerting if you point the rod directly at them as they seem to treat it as a directional arrow and follow it towards you before accelerating up over your head. It is almost like they are daring each other to see who can go the closest and elicit the most interesting response. You can almost imagine a judging panel on the far bank lofting scorecards after each participant finishes its aerial manoeuvre with a flourish. Needless to say this behaviour forces more than one sphincter to tighten. Why do I mention this? Well, when Paul started up the quad copter it sounded for all the world like a wasp swarm was heading my way. I swear my head did a complete 360 degree turn as I was figuring out where was the best place to dive in the estuary and submerge myself. Realising it was the only the quad copter I soon calmed down but I’m sure that a quick inspection of the laundry basket would show that I came very close to soiling my underwear. Long story short, aside from getting some nice images the fly fishing went without incident. I used a Clouser and smelt fly for 45 minutes without any substantive touches. At this point, I decided to revert to AA spinning rod and test it with a hard bodied lure, the ever reliable Yo-Zuri 3D vibe. This was also a revelation as I could cast the 14 gram lure to within 10’ of the far shore with minimal effort. Within 10 minutes of starting with the hard bodied lure I spotted a small work up where main stream enters harbour and set off at a very brisk trot to target it. Paul, his dog Louis, and quad copter followed in hot pursuit. It took about 5 minutes to get close enough to cast amongst the flecks of foam, which betrayed where the fish had been working, but within half a dozen casts I managed to hook up. Unfortunately by this time the quad copter battery was low so Paul had returned to our starting point to put the unit away and missed the action. We probably caught it on the chest mounted GoPro that I was wearing. This unit had audio capacity so no doubt you’ll hear me swearing like a navvy at Paul and whistling with my shepherds whistle, all to no avail. The kahawai was only around 14″ and spat the hooks when it jumped in the shallows. If I had not been trying to hold it on the line long enough for Paul to get back then I may have landed it. Hopefully the GoPro I was wearing caught it going aerial just before it got off. We opted to call it a day at this point. All in all a fantastic session, great company, unbelievable day. It will long live in my memory”.